My friend Jess flew out to visit at the beginning of May during my Golden Week vacation. Golden Week, which is pretty much like a five-day long Memorial Day weekend, is one of Japan’s biggest holidays and everything (including ATMs!) shuts down for the two official holidays that are the centerpiece of the five days off. Golden Week is especially glorious for professors at Osaka University, since the campus is closed on Monday and Tuesday for the biannual student festival. This gives us a total of nine days off, if you count the weekends on both ends. Since I knew that Jess would be waking up at about five in the morning because of jet lag, I figured that for his first full day here we would get out of the house early and head to Koya-san in Wakayama. Koya-san, or Mt. Koya, is a raised area of land surrounded by eight mountain peaks and is home to a series of monasteries and temples (collectively known as ‘Koya-san’) that form the spiritual center of Shingon Buddhism, which was founded here by Kukai (known as Kobo-Daishi after his death). Kukai was not only an incredibly important figure for Japanese Buddhism, he also invented Japan’s kana alphabet — the syllabary that generally supplements Japan’s use of borrowed Chines characters (kanji). Followers of Shingon believe that Kukai is not truly dead, but is merely sleeping in his tomb at Koya-san until the arrival of the Miroku Bosatsu, the Buddha of the Future. Koya-san is an appropriate resting place for the founder of Shingon, not least because the configuration of the mountains is said to represent the eight petals of the lotus flower, a representation of the universe. I imagine Kukai, curled in the center of a flower that’s covered with the scratch marks of a million letters, asleep for eternity in a text-world of ultimate significance until time is ended and he emerges. 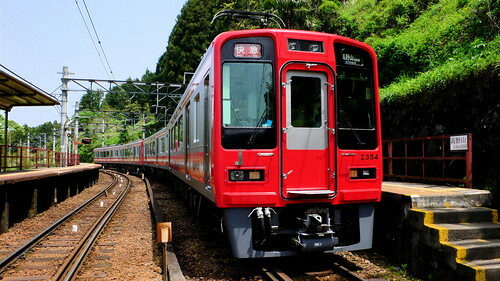 Jess emerged from his bedroom with rumpled hair and jet-lagged morning face at around eight and we started off on the two-hour train ride that would bring us to Koya-san. I knew that Koya-san was far, but I imagined it as somehow being more like Nara — a kind of mountain retreat surrounded by an urban forcefield. It turns out, however, that Wakayama can get quite rural quite fast, and the mountains around Koya-san actually border on wilderness. In fact, the train we were riding on ended up single-tracking into the mountains which meant long waits at the few double-track stations where the downhill train could pass. Once the downhill train had passed, we climbed into the mountains where we passed through cedar forests, crossed ravines on steel-trellised bridges, sped by hillsides covered with wild white irises, and contemplated the several hundred foot drop that kept appearing on our right. 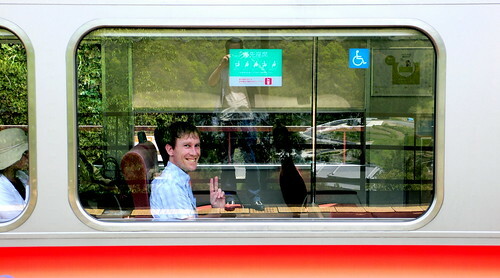 Here’s a picture I managed to take while the train was stopped at one of the many mountain stations on the Koya line. At the end of the train ride into the mountains is a funicular that takes you straight up the side of the mountain. 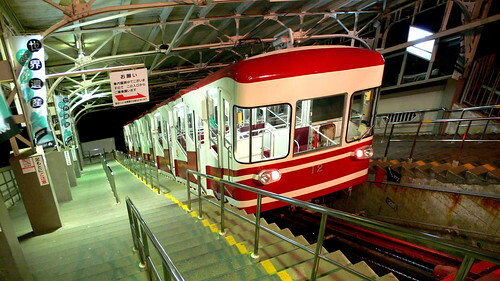 Funiculars are quite popular in Japan, and it’s difficult to describe the sensation of riding in one. It’s a bit like you’re riding in a mechanical caterpillar, or a kind of backwards funhouse rollercoaster that pulls you up to the top of a dropoff, but never drops off. Really, I don’t know the angle of the slope that the funicular travels, but it’s impossible to convey its steepness in photographs. This shot was taken at night on the way back from Koya-san. 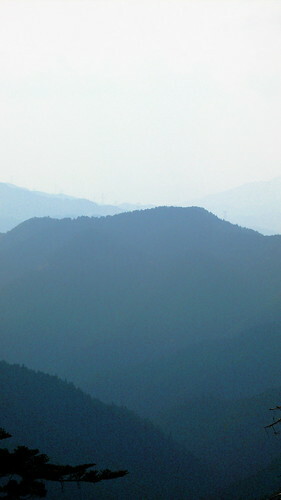 The view of the mountains surrounding Koya-san. Petal of the lotus? Click here to visit the official Koya-san homepage. (a little note from Tara’s sister…) Your photos of Japan are bright and beautiful! I am wondering how to get in touch with you as it would be a delight to feature your photography in the next issue of carnet de route, the poetry and graphic design / book arts project I work on with Jean-Hughes Bancaud in Paris. I sent you an email to your Berkeley address. But is this current? Could I ask you to acknowledge this email and let me know if you would be interested in sharing your work for our next issue. We go into production this summer. I went to Koya-san once. Absolutely bucketed down the whole time. Sorry to hear about the buckets at Koya-san, though I expect that Okunoin was twice as atmospheric in the pouring rain . . .